Mina Papatheodorou-Valyaki was chosen as an Olympic artist for the 2002 and 2004 Olympic Games. 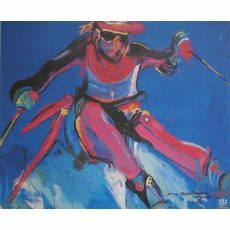 The Sport Artist of the Year 2002 has presented many one woman shows including Rome in 1993 at the Galleria Ca' d'Oro; Florence, Italy in 1999 at the CART Art Gallery; Monte Carlo in 2000 for the 'Villa Les Aigles' 58th Grand Prix of Monaco; and Athens in 2000 for the November show of Ferrari Genesis Executive cars; to name just a few. Valyraki has also been a part of group exhibits including some prominent showings such as the F.I.A.C. Expo-Arte Internazionale at the Galleria Morabito in Bari, Italy; and the Biennale Dello Sport in Belle Art I exhibit in 1992 in Barcelona, Spain. Valyraki's works are exhibited in the National Gallery in Athens, in the Olympic Museum of Lausanne, Switzerland, in the National Museum of Women in the Arts in Washington D.C., in the 'Lamborghini Automobili' Museum in Sant Agata Bolgnese in Italy, the UNESCO collection in Paris, the Olympic Museum of Barcelona, in Ferrari Genesis of Athens, and many, private collections in Greece and abroad.